Oslo the Owl is Having a Big Birthday! Oslo, the iconic ambassador animal for Potter Park Zoo, is 25 years old today! Oslo is a Eurasian Eagle Owl who is the best known of all of Potter Park Zoo’s ambassador animals. For the past 16 years he has wowed thousands of people of all ages, appearing in hundreds of educational animal presentations at the zoo and outreaches throughout the region. Oslo, due to his commanding presence, is especially popular at the many community events we attend and he is a key component of the zoo’s educational programs. As a 2 week old hatchling he was sent to the Cincinnati Zoo. He was hand raised there by zoo staff and once he was old enough to fly, Oslo became one of the stars of their flighted bird of prey show, flying over audiences heads in a large outdoor amphitheater. After several years of being in the flighted bird show, he was rotated out and lived in an off exhibit area of the zoo in his own enclosure. In May of 2003, Oslo came to Potter Park Zoo. During the next couple of months he got used to his new home and spent significant time with the zoo’s education and animal care staffs. He is a very impressive looking bird due to his large size, bright orange eyes and the beautiful coloration of his feathers. Oslo spent the first seven years of his life flying over large audiences, so he is very comfortable when there’s lots of people around. Owls are the perfect animal for teaching audiences about animal adaptations and natural selection. 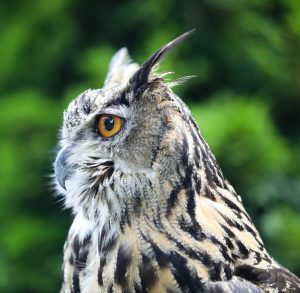 They are identifiable by even pre-school aged children and they have easy to see adaptations such as large eyes, facial discs, talons and camouflage. Oslo is very popular with our zoo guests and outreach audiences, many have seen him so often they expect to see him every time the zoo is present at an event. So, next time you see Oslo at the zoo, or out and about mid-Michigan, say “Hi” and wish him a Happy Birthday!